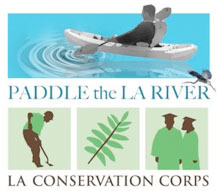 The historic Paddle The Los Angeles River pilot program begins next weekend (continuing Saturdays and Sundays through September 25) in which the public will be legally allowed to kayak/canoe in the Los Angeles River for the first time in I don’t even know how long… decades, at least. Now, it’s not something as easy as dropping a raft anywhere along the river that you’re willing and able. The event, a culmination of efforts between city officials, the Los Angeles Conservation Corps, the US Army Corps of Engineers, and a variety of volunteer and environmental organizations, is hyper-organized, super-supervised, and takes place specifically along the section of the river in the Sepulveda Basin Recreation Area between Balboa and Burbank boulevards. And it’s not cheap. Tickets run $53.74 a person. None of that hindered the 280* tickets available from quickly selling out after they went on sale this morning. Given how dear I hold the river to my heart, of course I was there at my computer when they became available at 7 a.m., reloading the registration page impatiently until it went live and I was able to order up two for August 21. A lot of other people weren’t as lucky. Less than an hour later they were all gone. uses, and its short timeframe only allows for a limited number of participants. This entry was posted on Tuesday, August 9th, 2011 at 10:06 am and is filed under environment, happenings, milestones, nature, outdoors. You can follow any responses to this entry through the RSS 2.0 feed. Both comments and pings are currently closed.